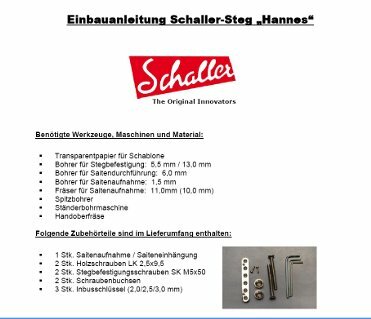 Everything that a guitar maker needs to know about installing Schaller's new Hannes® bridge can be found on this page. 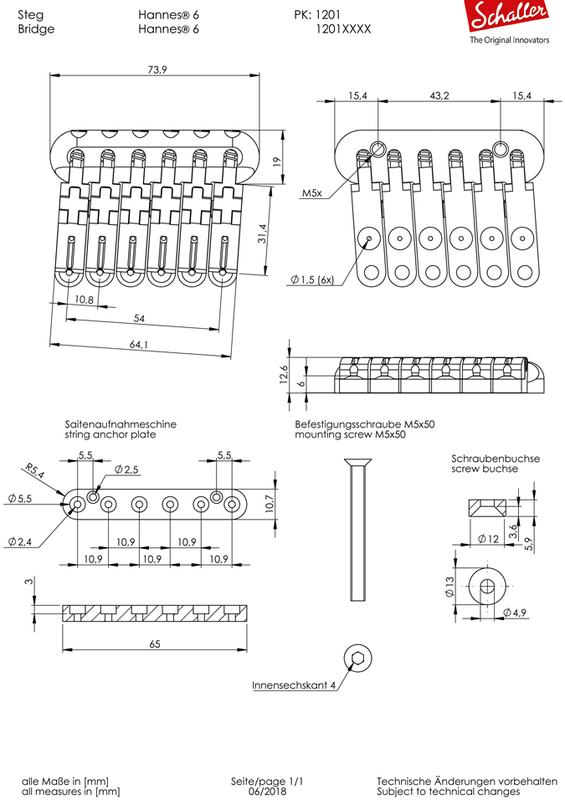 You can download here the technical drawings (pdf-file). 1.) For guitars without compensated saddle position e.g. Gibson, Fender etc. If you draw a line parallel to the frets through this point, you get the intonation line. 2.) For guitars with compensated saddle position e.g. Tom Anderson, PRS, Buzz Feiten etc. You can download here the Hannes® 6 Installation template. 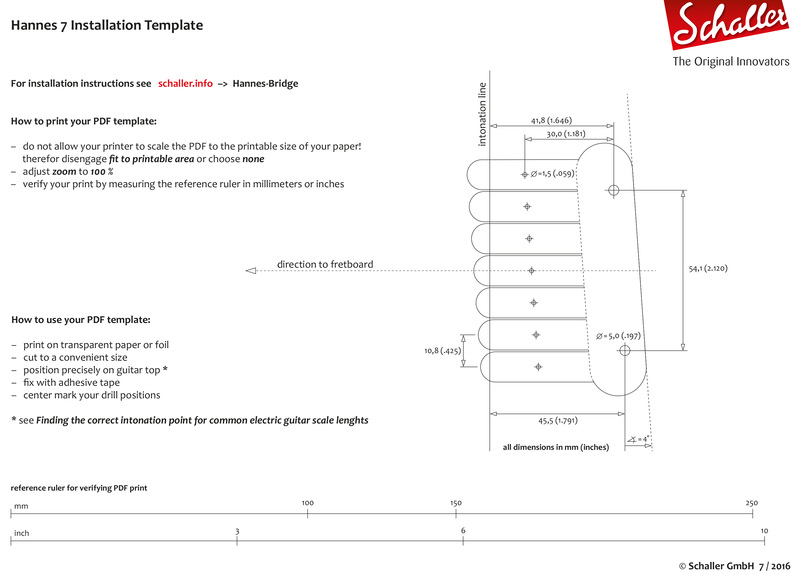 You can download here the Hannes® 7 Installation template. You can download here the Hannes® 8 Installation template. You can download here the installation instructions. A connection must be formed between each of the string sockets (or at least one in every two) and the potentiometer or the switch, either by soldering or crimping. Our Schaller Hannes® bridge can be fitted to any guitar, provided that the body is flat at the point where the bridge is to be placed. Begin by setting the Schaller Hannes® bridge up in such a way that the intonation screws are in the mid-way position (~ saddles are flush to the bridge). The front edge of the high E-string's saddle must match up to the mensur line (place it accordingly). First mark out the center axis and the mensur on the body so that the template for the Hannes® bridge can be positioned exactly right. Do this by laying a straight ruler of sufficient length on each side of the fretboard and marking the continued outline of the neck onto the body. ...mark out on the guitar body the center axis required to position the bridge. ...to the 12th fret (middle of the fret) by two; In our example, this is 323.85mm x 2 = 647.7mm, i.e. typical mensur for Fender instruments. The best thing to do is to use a tape measure to mark out the mensur on the central axis on the guitar body. Then extend the mensur point left and right (based on the central axis at a 90° angle to the center axis). Now position the template on the axial cross you have drawn and fix it with adhesive tape (the line marked on the template must run over the axial cross). Use a sharp flat drill to mark out the required drill holes. Once you have removed the template, you can drill the holes for the bridge to be mounted; now drill the holes for fixing the bridge and for the string ferrules (on the front of the body). In order to drill the holes exactly, a box column drill is absolutely necessary. 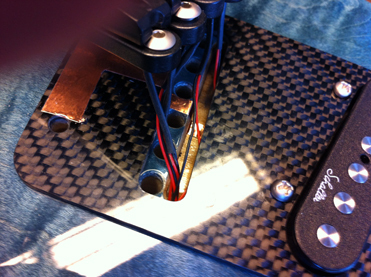 ...to accomodate the two sockets for the two flat head screws. At this point, you can also check the toleranced dimensions for the bridge mounting screws. If the bridge mounting screws are too long, they can be shortened using a metal saw and deburred using a file. ... to check that it sits correctly and that the mensur is correct. We would like to take this opportunity to thank the guitar maker Thomas Amberger, from the Oberpfalz in Bavaria, for helping us to put together these installation instructions! Schaller presents the guitar bridge of the future! By far the most comfortable bridge on the market. The perfect combination of sound properties of all bridge constructions on the market. The sound is characterised by fine high notes and quick responsiveness, with distinct, powerful and even playback. Contact-friendly material and a comfortably designed, edgeless surface. Non-wearing due to the lack of metallic coatings. Both fresh and subdued in appearance, it further emphasises the guitar’s premium design. Each string is fed via a separate coupler unit individually adjustable in terms of intonation and height (saddle/string plate).. The individual couplers lie flat on the guitar surface. The bridge unit vibratory mass has been minimised. The bridge is low-maintenance and is comfortable to play. This new high-tech guitar bridge was developed over a number of years by Roland Hannes, a French inventor now living in California. Thanks to a partnership formed together with the world’s most renowned hardware manufacturer, Schaller GmbH, it can now be produced and supplied on a large scale. 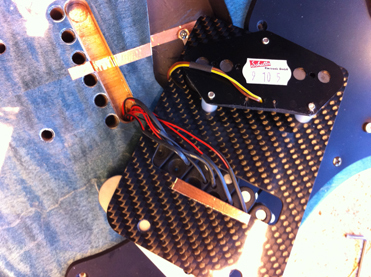 Each string is fed via a separate coupler which is individually adjustable in terms of intonation and height. While conventional guitar bridges feed all six strings via a common carrier, be it a Tune-O-Matic bridge or bridges with an integrated base plate, Schaller’s Hannes® bridge follows a new logic. With this revolutionary concept, each string is fed via a separate coupler unit with individually adjustable intonation and height. It lies directly on the guitar surface and is free of intermediate elements such as stud screws, threaded studs or metal plates. This decouples the vibration of the individual strings from the neighbouring strings, allowing it to be transferred directly and independently to the guitar body. If the strings are in a common carrier, then each of the individual vibrations is subject to the physical influence of the other vibrating strings in the group, thus compromising their harmonious response. This has undesirable crosstalk effects - the acoustic energy between the strings is nullified and/or, alternately, strengthened. Not so with Schaller’s Hannes® bridge. Here, every string vibrates on its own because all of the transfer points, namely the bridge, are consistently decoupled from one another. This improves the harmony response and the “string-to-string definition”. The individual bridges lie flat on the guitar surface. A further improvement over conventional designs is the larger contact surface over which the vibrations are carried from the bridge to the body. Depending on the design, the coupling with conventional bridges is via tiny stud screws or knife edge tabs only. Therefore, these types of small transfer surfaces are also known as “micro-coupling”. In this context, if you consider the classic string instrument construction which has been based for centuries on the ideal vibration coupling of string and body, the generous dimensions of the contact surface between the bridge and the top makes sense. This is precisely the case with the most expensive jazz guitars, and with good reason! Despite being individually adjustable for height and length (octave clarity), the couplers lie flat and stable on the guitar surface and thus ensure the optimal transfer of the entire vibration spectrum to the instrument. Micro-coupling causes inadequate transfer of those very deep frequencies in particular, which are considered essential in electric guitars today. 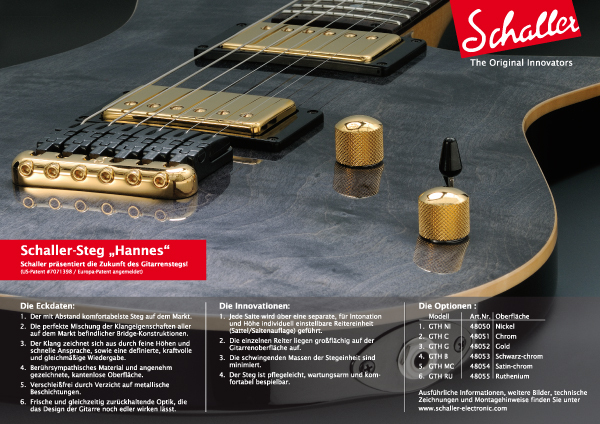 With this, Schaller’s Hannes® bridge is an innovation you can truly hear. Inventor Roland Hannes took another step towards further optimising the acoustic responsiveness. He addressed the issue of mass – that means the reduction of the vibratory mass of the bridge unit. His findings: the lower the vibratory mass, the quicker the tuning process and the lower the loss in the transfer of the sound spectrum to the instrument, from the lowest frequencies right up to the harmonics. The result is a direct, audible and tangible gain in dynamics. His quest took him to the Canadian company Graph Tech. Hence the use of the latest composite material – heat-treated high-performance polymers with Teflon, known as “String Saver” - a patented development by Graph Tech. This revolutionary new composite material provides a further elementary advantage in addition to the remarkably low specific weight of 1.75 g/ccm* along with its tremendous rigidity and resistance. Due to the incorporation of Teflon, the “String Saver” ensures astoundingly little friction on the string contact points, as if they were constantly being lubricated. The metal saddles generally used on guitar bridges (regardless of whether steel, aluminium or bronze) are not without their problems, because the strings gradually cut a narrow, sharp-edged groove in the surface, in which they ultimately become caught and can break as a result of fatigue fractures. The “String Saver” string bridge’s lower friction counters the much feared risk of broken strings very effectively. At the same time the sustain, i.e. the reverberation of the vibrating strings against the steel saddles, is extended by about 15%, and by about 25% when compared to bronze saddles. The bridge is low-maintenance and comfortable to play. 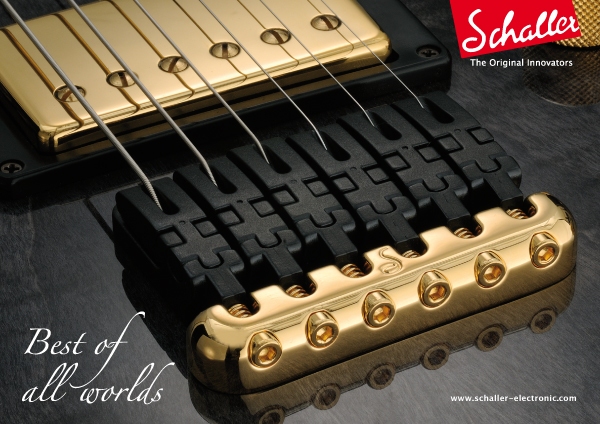 Schaller-Bridge The design of Schaller’s Hannes® bridge means that it has no protruding screws, edges or spikes at all and the flat design guarantees outstanding playing comfort. Unlike coated metals, the surface is comfortably warm and completely resistant to the usual problems like hand perspiration and oxidation. At the same time, the use of Teflon means that the bridge offers a high degree of tuning stability. Unlike with metal feeds, the strings can no longer become caught in grooves (one of the most proven frequent causes of tuning problems). The revolutionary and consistent “form follows function” design available in Nickel, Chrome, SatinChrome, BlackChrome, Gold, Ruthenium, SatinPearl and VintageCopper also ensures an image which is as contemporary as it is future-oriented.